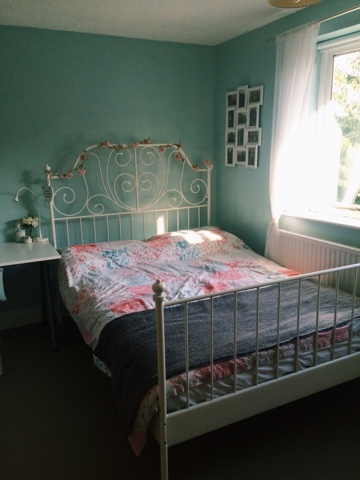 Hey everyone, so recently I got my bed room redecorated for my birthday (October), and only now do I think that it's finally finished and I love it! It used to be purple and have posters all over the walls and It always felt so dark and I wanted change it for ages! 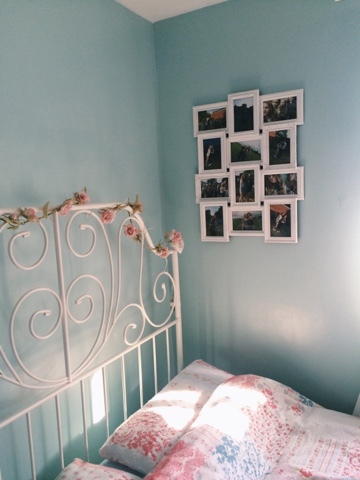 You may call this the usual 'blogger/teen' taste of floral and white but I love it. 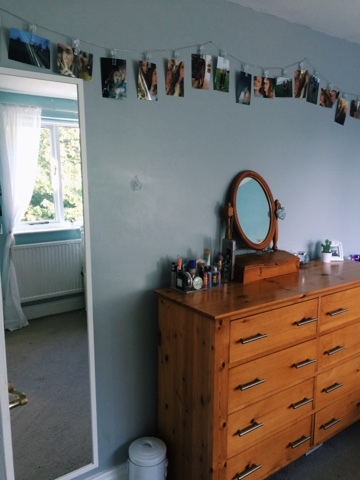 So here's my finished room - if you see any items that you want to know where they're from/how much just comment below! So this is what you see as you walk in my room, as my room is at the front of the house I got all the sunlight so my rooms always bright which I love! First off there's a mirror to the left and my bin. 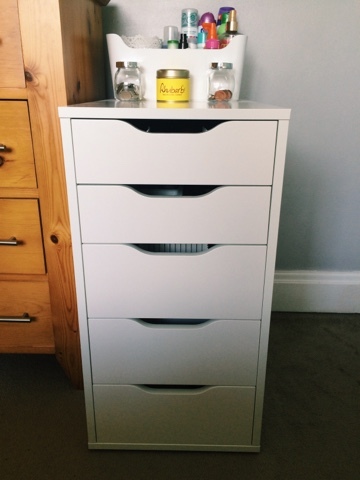 Then there's my dressing table, which holds some of my clothes and socks etc. 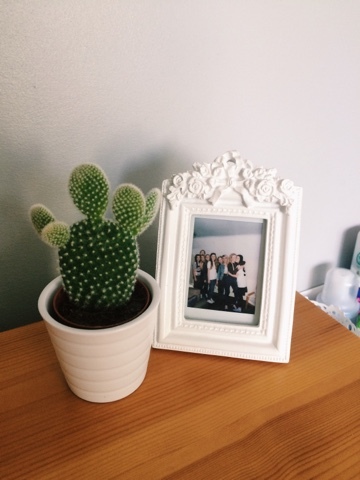 on top is my mirror, pot of makeup brushes, makeup and a cute little frame and cactus. 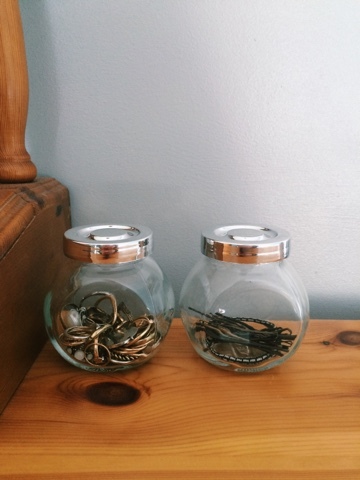 Also, two little jars which hold rings & grips. Hanging above I have the cutest fairy lights which have little pegs on so I've pegged my favourite photos up. 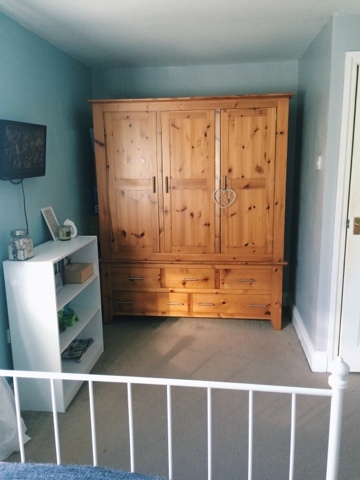 IKEA, these were £50. 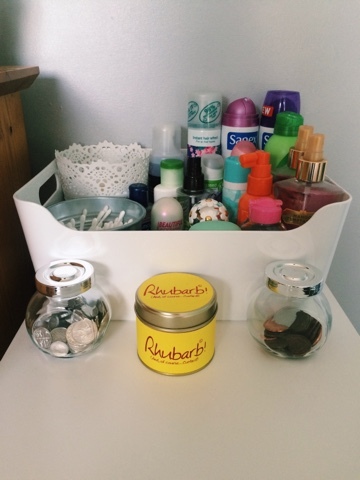 I use to hold my makeup, hair, nail and body products. 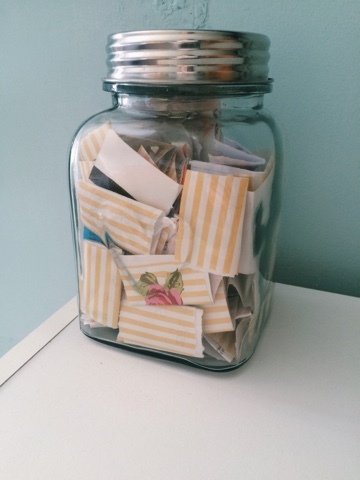 (I'm planning on doing a blog post on my makeup storage so you'll beable to see inside the drawers then! 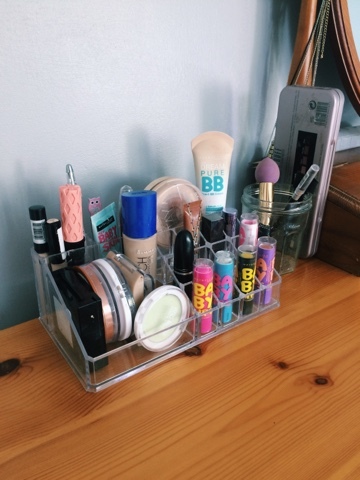 On top I have my beauty products that I use everyday so they're easy to grab. Infront of the box are again two little jars from IKEA which I use as money jars and a Rhubarb and Custard Candle which smells absolutely amazing! 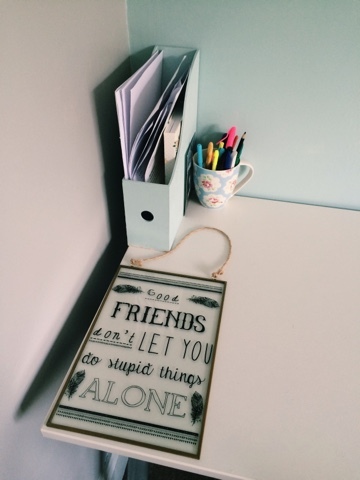 My desk is my favourite part of my room! 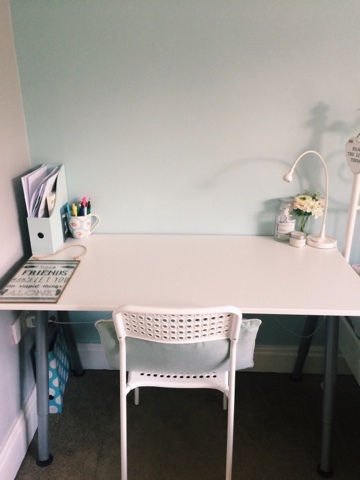 The desk is from IKEA (£49) and fits perfectly next to my bed! On my desk is just a work book holder thing from IKEA which i painted the colour of my wall, a Cath Kidston mug which i hold all my pens in and on the other side I have my lamp which is from Ikea (£10), I have a little pot of fake flowers from TKmax which are so cute, a gorgeous jar which I think really suits my room and my Zoella Beauty candle (£5) which smells fab! 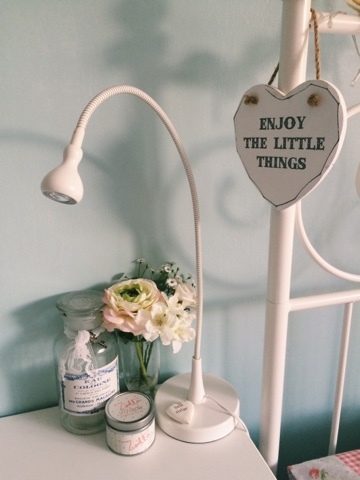 Hanging off my bed is a little wooden heart and the quote that's on it is one of my favourites ever! 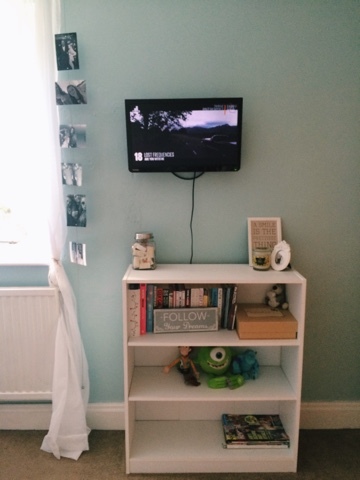 At the end of my bed I have my tv, a white book shelf which just holds my books mainly. 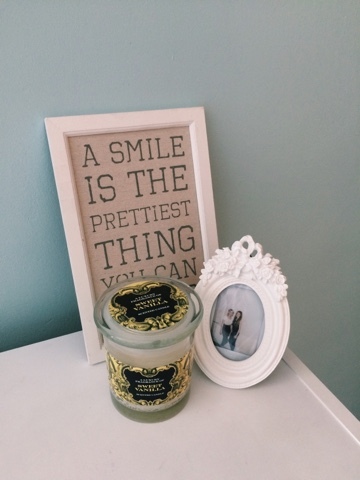 On top is my 2015 memory jar (Tkmax) and a little canvas with a lovely quote on, another little frame and yet another candle in the scent vanilla which also smells amazing! 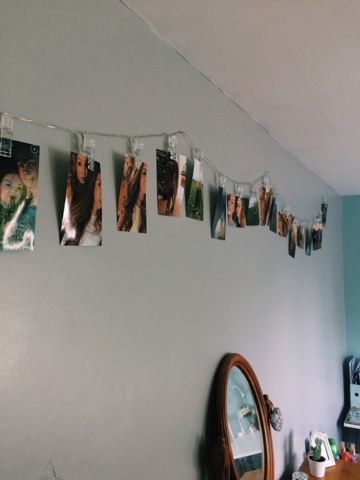 In the last photo you can see my photo wire hanging off my curtain pole, I got this off findmeagift.com and it's basically a magnetic wire that comes with loads of mini magnets which you use to hang photos and I thought it was so cute and a different way to have photos around your room! So that's my bedroom, it's hard to explain everything without writing pages and pages but you can always comment below with any questions! I'm very happy with my room and i feel like everything comes together and matches really well! I love your room its so nice! I rearranged my room last weekend, and it looks much more spacious I want to do a room tour too!